If you've ever struggled to open a pit zip while muscling uphill with your backpack on, you will appreciate the ingenious location of the ventilation zippers on the Dynafit Mercury Softshell Jacket. Starting just behind the outside of your shoulder, they are a cinch to grab with one hand and won't get trapped under your pack straps. A great feature on an classic, stretch-woven softshell that is wind and water resistant wtih high breathability. Dynafit accomplishes this without a membrane, but a unique single-ply combination of nylon and elastane called Silvershell™, which is stitched together with precision. Wind resistant and water repellent with high breathability. Frustration-free zip ventilation located at the back of the armpit and easily pulled down the arm. Adjustable cuffs to secure your glove <-> jacket interface. Adjustable hem to seal in your warmth and seal out the snow. Hood with visor fits over a helmet and is adjustable from behind the head. Multiple pockets for quick access to cameras and energy. Thin fleece lining around neck prevents chaffing and adds a touch of warmth. Anti-microbial properties on the abrasion resistant fabric to help prevent odors and scuffing. Option to match with the Dynafit Mercury pant. Materials 88% nylon, 12% elastane shell, 100% polyester lining. This is my go-to outer layer for day to day touring. I find it very comfortable in a huge range of temps, having worn it everything from spring tours up to 40 degrees down to 5 degrees with a microgrid fleece underneath. I've spilled coffee all over the front and scraped it up on rocks and it still looks good. There is some wear appearing on the lower back area, the highest impact area under a large pack. I'm 6', 180lbs, and got a large. I have a slightly long torso and long arms, and this is a great fit for me. It's a hair long which keeps it tucked into a lightweight harness perfectly. I can stash skins in the front pockets, and the tricep zip is great. I don't know that I will ever want a jacket with pit zips again. I always seem to get beard hairs stuck in the zipper in other jackets, but this never happens with this particular config. I have a huge dome, and the hood works great with and without a helmet thanks to a great shape and a well placed pull cord on the back. Other tiny details I appreciate: the sleeves and sleeve closure is dialed for me. Opens just as much as I need it to clear my gloves, cinches down easily with no wasted material. Few other jackets ever get it this right. Zipper pull is just big enough. The brim is stiff enough to stay up, but not so stiff that it gets bend out of shape or anything like that. I purchased this jacket last year and have probably used it about a dozen times, mostly for touring with a couple hikes thrown in. I sweat a lot when I'm exerting myself. Like, a lot. Just thinking about it I'm starting to break a sweat. As a result, most waterproof/breathable shells leave me swimming in my own moisture. I was looking for a jacket that would cut the wind, repel light moisture but above all breath. I settled on the Dynafit Mercury and have been very happy. I am 6' 1" and 160 lbs and the medium fits me quite well. It is a slim fit but I could put a midlayer under it no problem. I usually wear a light base layer, then the Mercury and still have room to stuff skins in the front. On the way up it breathes better than any other jacket I've worn and I appreciate the tricep zippers. They really do make a difference (although they have iced up on me, forcing me to keep them open). For the ride down I just zipper up and the jacket does a decent enough job of keeping me warm for the down. There is a brushed lining around the neck that allows small zipper adjustments to make a remarkable difference in warmth. The hood can fit over a helmet and has very useful adjustments to cinch it down if needed. As far as water repellency goes, it does fine in a light snow or drizzle. If its snowing hard but cold the snow just falls off. If its a warm snow it'll melt on the jacket and start to get saturated. The chest pocket can fit goggles. The material is awesome but won't be as durable as a hardshell. I've sweated hard in it and it doesn't stink. 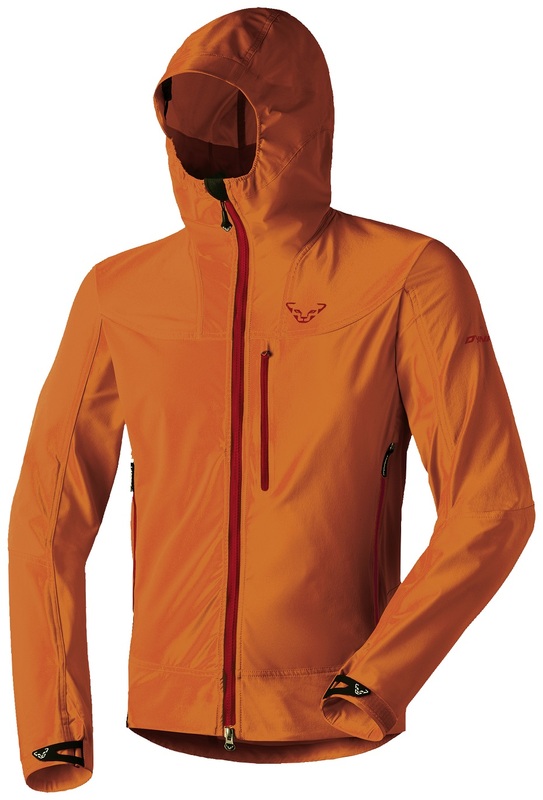 In closing, this jacket doesn't replace a true hardshell but for 80-90% of conditions it is perfect. What is the big difference between Dynafits Mercury Jacket and the Seraks Jacket?? Hi Steve, the Seraks is more of a wind shell, using the Gore Windstopper membrane. The Mercury uses a proprietary fabric blend and is a bit warmer with a very light fleece lining. It also has the cool back-of-the-arm zip vents.